Dispatched in 3 business days. Shipping Time Extra. Processed in 3-5 business days. Shipping Time Extra. Description of "The Scribe Remembered: N.Gopinathan Nair, his Life and Times "
This book is to commemorate Comrade N. Gopinathan Nair, also known as Janayugom Gopi, who was the founder editor of Janayugom, the first weekly, and daily, newspaper of the undivided Communist Party in the Travancore region of Kerala. He later moved to Delhi and worked as a journalist there for many decades. It is in memory of a person who never cared for an autobiography, biography or a festschrift. The period that he was born, and grew up in, is of historical importance for many reasons. Not merely India, or Kerala, but the world over witnessed many changes in the decades following the First World War. Poverty and unemployment were on the rise. New ideas, dreams and aspirations embraced people. Dignity, pride and freedom of individuals, community and nation created new thoughts in the social mind. If we were to speak of our country, to give these notions new life and energy, the freedom struggle with its new strategies acquired a place in people’s minds. This was also a time when women and men in large numbers entered the movement without a thought for either the price to be paid, or even a desire for personal gain. It is necessary for both younger and older generations to know and remember the history of the young people who fearlessly encountered the challenges of that time; the young – who are either bewildered by the bigger and more complex contemporary challenges, which often appear to be confusing, or express their helplessness on the grounds that “times are changing, and we are unable to stem this” . The book has an introduction by the author followed by a collection of NGN's articles in Malayalam and English. Then there are obituaries which appeared after his passing in June 1991 and finally a section called Memories where friends and former colleagues remember this fine editor and kind human being. The book is illustrated with photographs in both b&w and colour. 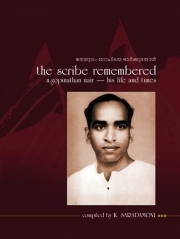 Reviews of "The Scribe Remembered: N.Gopinathan Nair, his Life and Times "